What are the hardest and easiest languages to learn? We have both good and very good news for you. The very good news is that all languages are learnable. The good news is that they are each learnable at different rates and speed. 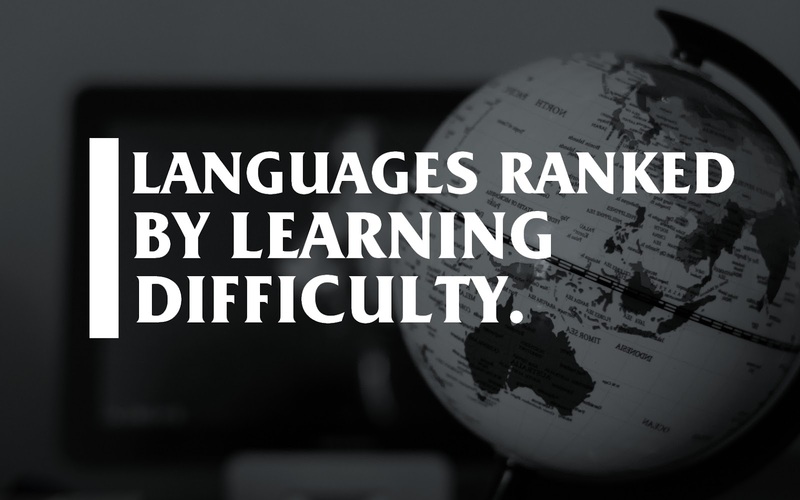 In this blog post, we brought to you an infographic that was put together by Voxy in which languages were ranked by learning difficulty. It's a very quick read, savor it! If you talk to a man in a language he understands, that goes to his mind. If you talk to him in his language, that goes to his heart. The top of the infograph says that the rankings are based on the apparent difficulty for native speakers of English. I find it interesting that you show Dutch, Norwegian, Swedish etc. in your surrey, but completely leave out the language with the most native speakers in Europe. What language are you talking about??? Russian is there. I bet the reference is to German, which is the official language of Germany and Austria and the most common language in Switzerland. Besides, not all Russian speakers are in Europe, and Russia has many ethnic groups whose native language is not Russian. German would be difficult to place on here. It is for sure more difficult than Spanish, Norwegian, or Dutch, but it is easier than Russian, Finnish or Turkish. In my opinion, it is probably closer to the easy category despite the fact that German grammar is notoriously difficult. German grammar is not difficult at all. It is actually higly logic. Korean is definitely not that difficult! It has less characters than the English alphabet. Korean is far from more complicated than English...do you speak Korean ? Having studied Korean, I can say that the grammar is entirely different from English. You can't imagine how different unless you've studied Japanese. Let's say that Korean is like Japanese plus extra difficulty when it comes to learning. The hangul alphabet is the easiest part. Essentially, the closer a language is to your own, the easier it is for you to learn. Koreans learn Japanese easily, because the grammar is similar and both languages have borrowed a lot of words from Chinese. I miss the easiest Language ever: Esperanto. And the idea behind it gives you one more reason to learn it! I was astonished also that Esperanto isn't mentioned. In comparison you need about 150 hours to reach the same level as with around 600 hours in Spanish etc. It should be mentioned, because in the 20th century Esperanto became a living language with books and songs and Wikipedia and even around 1000 native speakers (and families with a history of five generations of Esperanto speakers...). I call shenanigans on some of these numbers. Some folks have a natural gift for learning new languages, while others definitely do not. I don't believe that your average English speaker can become 'proficient' in another European language in only 600 hours. Studied Spanish in high school (one hour long class for two years) and Korean in the Army at the National Defense Language Institute (8+ hours a day for 63 weeks. In comparison to Korean, Spanish is just English with a different accent. Sure the Korean alphabet is simple, but English speakers have difficulty distinguishing between some of the different sounds, much like Asians confuse R and L. The language is structured completely differently, and though they don't have tone, like Chinese does, many of the words are based on Chinese words, so there are tons of homonyms, and the only way to determine meaning when listening is context. Sometimes in writing they'll put the Chinese symbol upon which the word is based next to the word to add clarity. Of course this requires knowledge of written Chinese. Only 20 millions thai native speakers? WTF? I can see no list at all. Only a headline. Japanese is very easy besides medium difficulty pronunciation and difficult kanji (whilst there are other spelling systems so although not knowing it is very bad it's not essential). If you wanna explore some Paleo-Siberian languages (for example, Nivkh, Itelmen, Yukaghir, Ket etc. ), be ready to get the brain explosion. In my humble opinion, Ket grammar is a thousandfold more difficult than Japanese grammar. 6 Grammatical mistakes no language nerd should make. Many of us get into the habit of making writing mistakes either because of unawareness on our part or just mere sloppiness. Many of these mistakes affect the way readers perceive our pieces of writing; foolish typos can make the difference between a great first impression and a tainted one. We at The Language Nerds took the liberty to collect the most common mistakes that the majority of people tend to make and we want you to watch out for them so that there is nothing to worry about when you want to apply for your next job or when you want to email your boss. So let's see what we've got!